A range of cooked dishes ready to be re-heated at home. Please see the individual item descriptions for the servings per jar. Wild boar sauteed in red Burgundy with onions. Serves 2. 750g Jar. Reheat and serve. 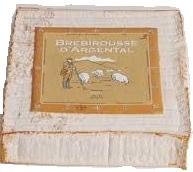 The classic French dish made with Charolais Beef and carrots. Serves 2. 600g Jar. 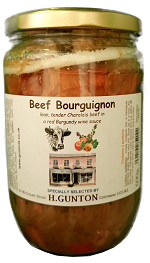 Ingredients: Charolais Beef 68%, meat stock ( water, natural flavours), red Burgundy wine (SULPHITES) 7%, red wine (SULPHITES), bacon (belly pork, brine: water, vinegar, salt, sugar, pepper, thyme), carrots, onions, mushrooms, modified corn starch, WHEAT flour (GLUTEN), garlic, pigs blood, salt, thyme, pepper. 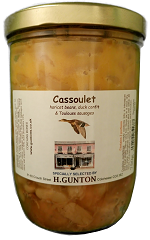 Duck confit, Toulouse sausages and haricot beans in this classic French dish. Serves 2/3. 750g Jar. Reheat and serve. Ingredients: Haricot beans 40%, sauce (water, duck fat, corn starch, tomato concentrate, salt, glucose syrup, chicken fat & meat, onion, vegetable fat (MILK), flavours, dextrose, duck meat, pepper, natural flavours, caramel, spices), Toulouse Sausage (pork meat, salt, pepper) 16%, duck drumsticks 15%. Tender chicken slow cooked in Red Burgundy wine. Another classic dish. Serves 2/3. 600g Jar. 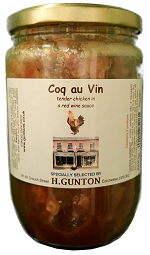 Ingredients: Cockerel meat 59%, poultry stock (water, natural flavour), red wine (SULPHITES) 12%, mushrooms, onions, bacon cubes ( belly pork, salt, dextrose,acidifier E330, preservatives E316 & E250 ), modified corn starch, pigs blood, WHEAT flour (GLUTEN), salt, seasoning, spices, pepper. Two succulent legs of duck cooked in their own juices. Serves 2. 750g jar. Our most popular meal. 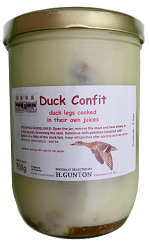 Delicious with potatoes sauteed with bacon in some of the duck fat.